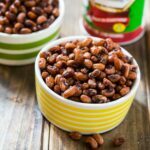 Crispy and spicy Roasted Black-Eyed Peas are just the party food to serve for New Year’s to bring good luck in the new year. They also make a wonderful light and healthy snack which we all need plenty of after the holidays. 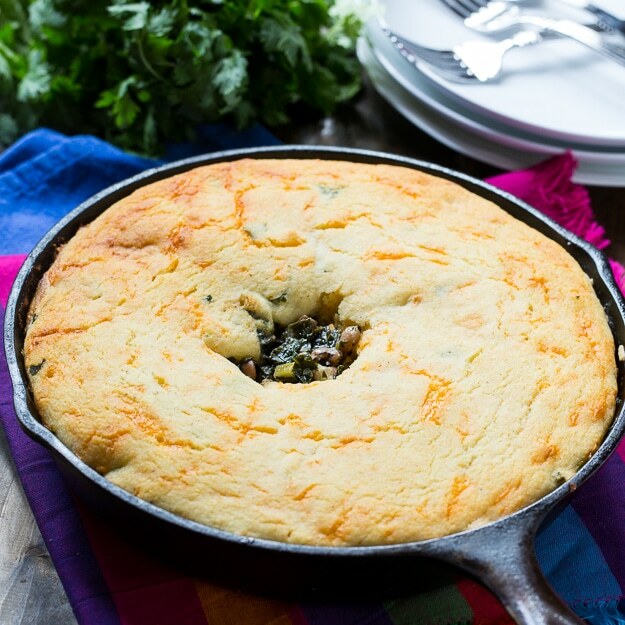 This recipe is fabulously easy. Drain and rinse 2 cans of black-eyed peas. Spread them out on some paper towels to dry them out a bit. Then place them on a lightly greased baking sheet and drizzle them with oil and sprinkle Cajun seasoning and paprika on them. 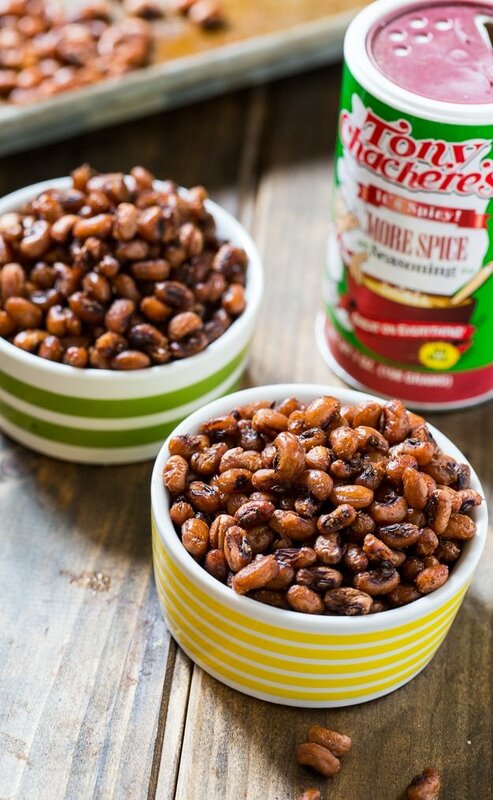 I love to use Tony Chachere’s More Spice Seasoning . It’s something my roommates in college introduced my to. They were from New Iberia, Louisiana and put Tony Chachere’s on just about everything. 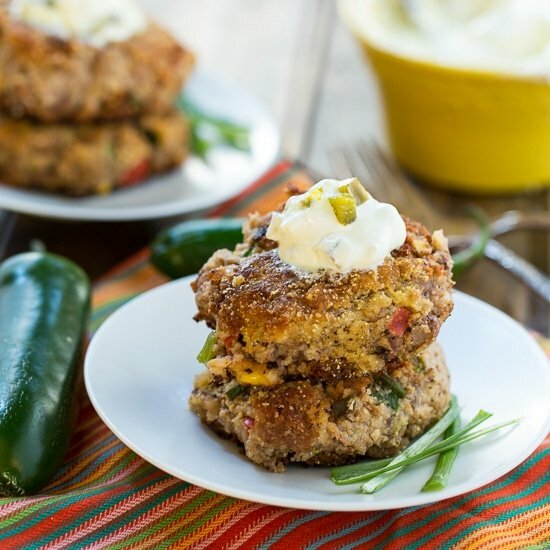 Not only does it have lots of spice, but plenty of flavor from garlic powder and chili powder. It is salty though so you’ll have to watch how much you put on your food. 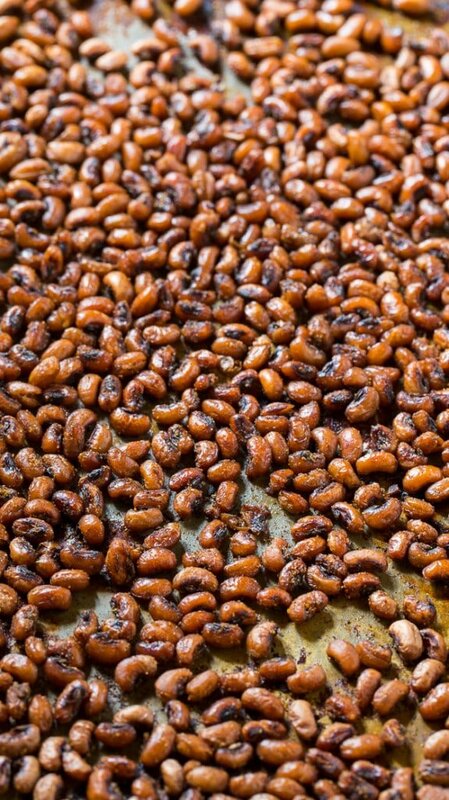 And if you use a seasoning that is less salty for these Roasted Black-Eyed Peas, you may want to add some salt. 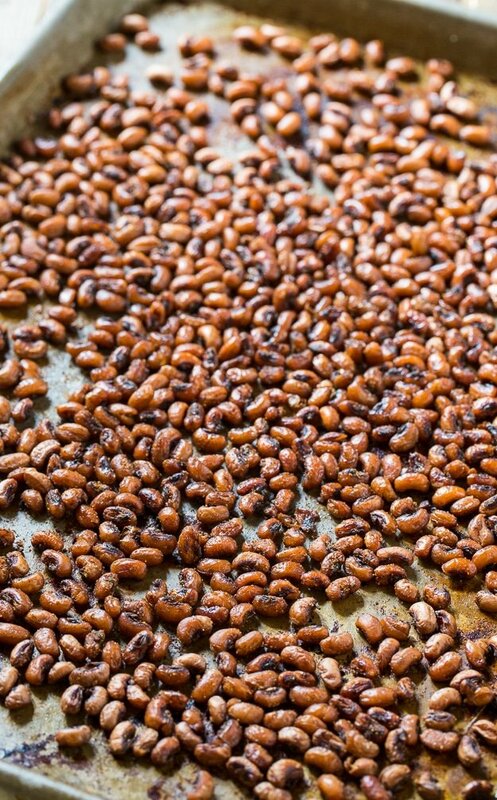 If you don’t have much luck getting the black-eyed peas to dry out, you either haven’t cooked them long enough or you may need to use a different brand of black-eyed peas. I had good success with Hanover Black-Eyed Peas. Roasted Black-Eyed Peas are crispy and spicy and make a great healthy snack to munch on. Spread balck-eyed peas out on paper towels to dry some. Transfer black-eyed peas to prepared baking sheet. Tony Chachere's seasoning is fairly salty. If you use a less salty cajun seasoning, you will also want to season with some salt. 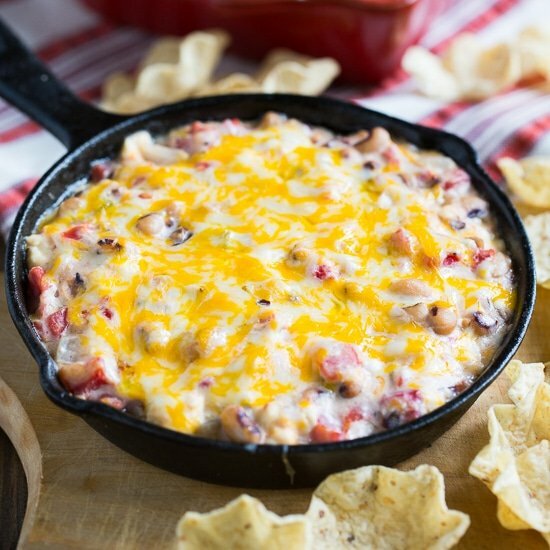 This entry was posted in Appetizers, Snacks and tagged black-eyed peas, New Year's. Bookmark the permalink. They are popping an awful lot while baking… is that normal? Looking forward to trying these… they smell delicious! They do pop some. Hope they turned out well! Do u have recipe for doing them in a crockpot? 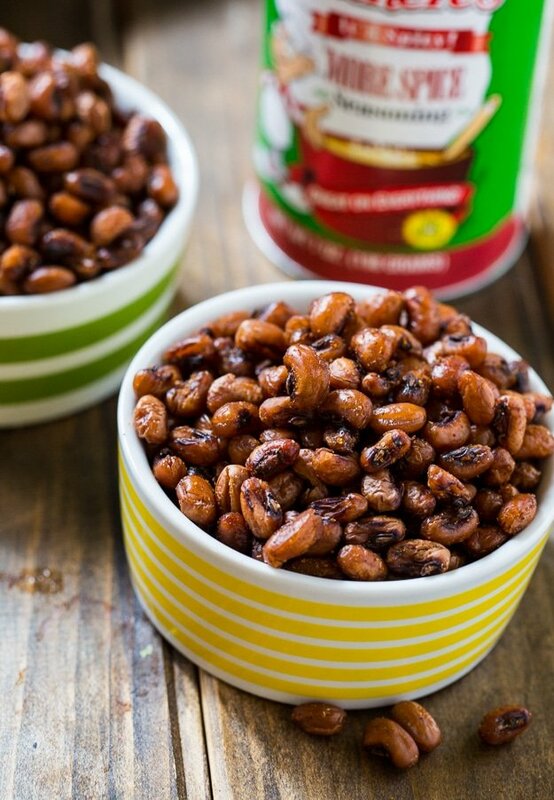 I’ve never tried roasting black-eyed peas before, but that’s such a great idea! I may have to give this a try for New Year’s! I always mean to make black eyed peas for new years and then never do! haha These look awesome! Hope you had a great holiday!! I love black eyed peas but I’ve never had them roasted- delicious! 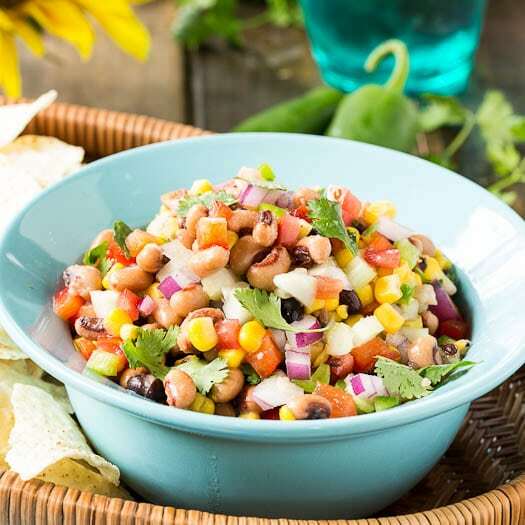 I’ve never had black eyed peas like this before – and Christin I cannot wait to try this! LOVE LOVE LOVE these roasted and spiced little peas! I know and looooove roasted chickpeas but I never would have thought to roast black eyed peas, they are actually beans, aren’t they? What a great idea, I can’t wait to try this! I think I’ve only had black eyed peas about once in my life. This looks so tempting! And that spice seasoning is my dad’s absolute favorite. He loves it on everything.